CINCINNATI -- Epicurean Mercantile Co. quietly opened its pristine new grocery store in late May across Race Street from Findlay Market in what had been a vacant shell. 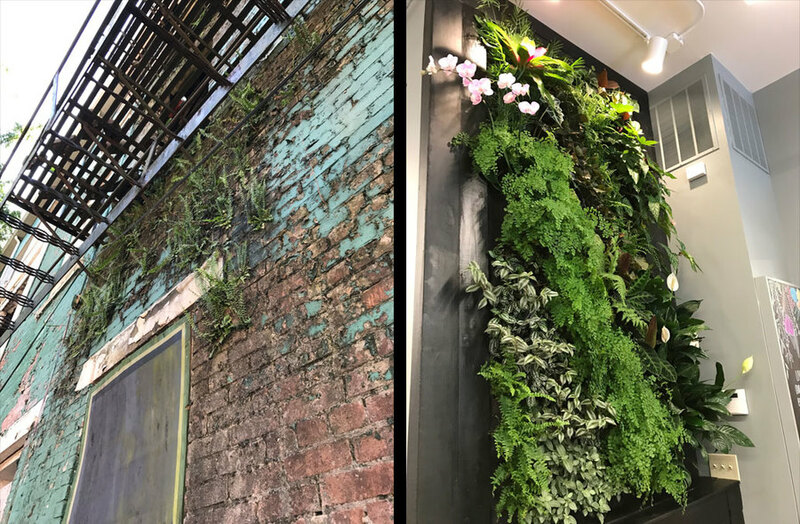 Packed with name-brand staples and premium organics amid a sleek design with features like a floor-to-ceiling plant wall, EMC marks a new high point in the Findlay Market area's resurgence after a generation of decline. 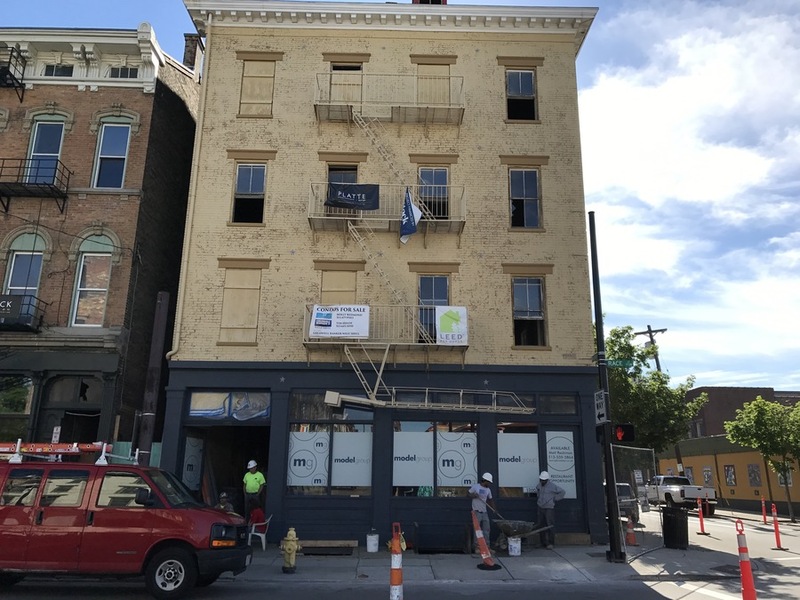 Still, dozens of buildings in the blocks around Findlay Market remain uninhabitable shells stamped with city of Cincinnati vacant building plates. Developers, entrepreneurs and city officials have set their sights on transforming that pockmarked landscape with busy shops on street level and homes and offices above. 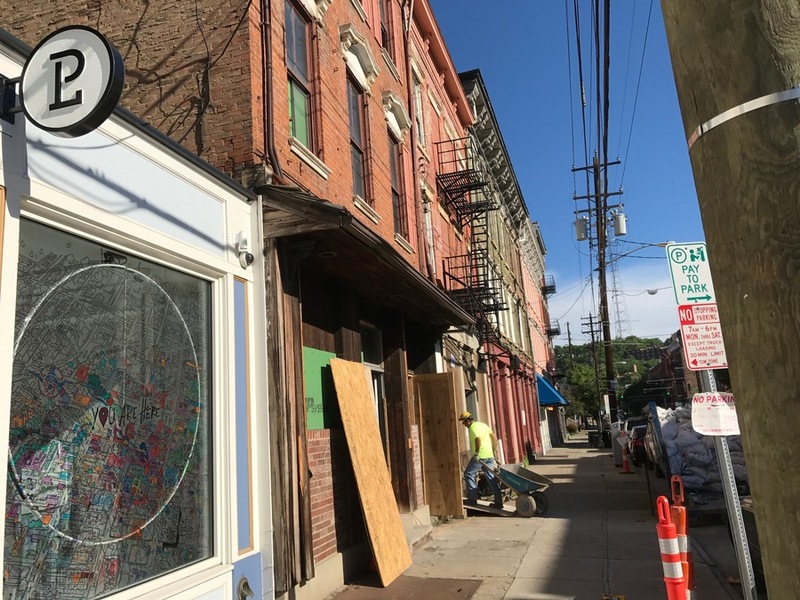 They want to create a Findlay Market District, a mixed-income neighborhood and business district that's uninterrupted by vacant buildings that would make wary walkers hesitate. They're on their way to that goal, but challenges remain. "A lot of that comes form reactivating the street front, not just having people living above but store fronts," said Bobby Maly, a principal owner of Model Group . Model is betting big on the Findlay Market area, buying more than 35 buildings around the market, including the entire east side of the 1800 block of Race Street. Epicurean is the first street-level business, which Maly is confident will be an anchor that draws a lot of neighbors. 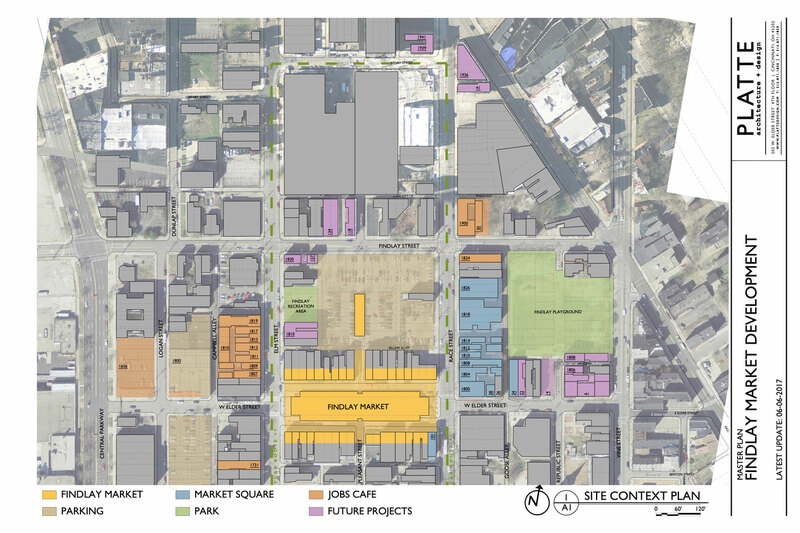 Model Group's master plan for investing in the Findlay Market District. "We're doing it. A lot of other tenants are coming in behind them. We have all but one of that entire block spoken for or leased," he said. The holdout is a grand building on the corner of Race and Elder that is being marketed as a destination restaurant. EMC co-owners Meredith Trombly and Louis Evan Snowden took the leap to open their 5,000-square-foot grocery store and a 1,000-square-foot restaurant in the back after running Fresh Table in Findlay Market for more than six years. "The confidence to open this came from knowing that (the growth) is already happening," Trombly said. EMC fulfills a long wish of neighborhood planners by staying open until 8 p.m. daily. It includes The Counter restaurant, serving hot entrees, fresh salads and sandwiches plus small plates. Diners can eat inside or on the patio, where they can enjoy surprisingly pastoral views of the forested hill Fairview Park rising above OTR. EMC fills in some gaps in Findlay's offerings like paper towels, name-brand pet food and baking supplies, and adds lots of produce and packaged goods. "It's just going to spread out from here," Trombly said. "We are beyond excited." The Race and Elder streets redevelopment has gone well enough for Model Group to launch its second phase rehabbing most of the 1800 block of Elm Street plus two large buildings on Elder Street stretching west to Central Parkway. "The way you do it is acquire as many buildings and renovate as many as you can so you have a critical mass," Maly said. Room for the little guys? Redevelopment has reached a critical mass for smaller operators to be able to do one-building projects, he said. Wade Dent is marketing a vacant building directly across Elm Street from the bustling Rhinegeist Brewery and tap room. "I've always been bullish on the Findlay Market area, more so even than the city's commitment to it," he said. 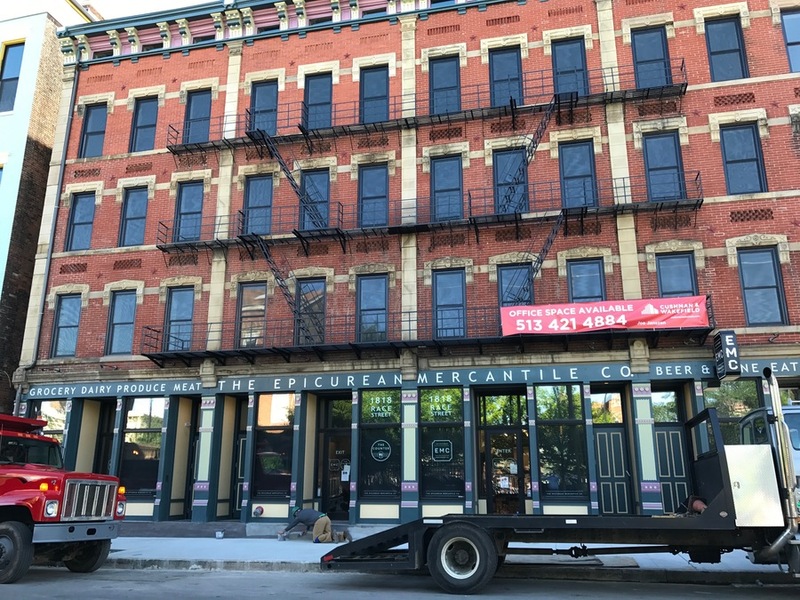 Dent bought his first building in Over-the-Rhine in 1997 and the first one near Findlay Market in 2002. "I made investments in the neighborhood way back then expecting there to be a wave, and it didn't happen," he said. He sold 1800 Race St. -- the big yellow building slated for a destination restaurant -- to Model Group, coming to terms with the idea that a developer with "really big trucks" would be better suited for that project. Still, he's confident that his smaller property on Elm Street will be developed into a café or other small commercial operation. "We're getting near critical mass," Dent said. 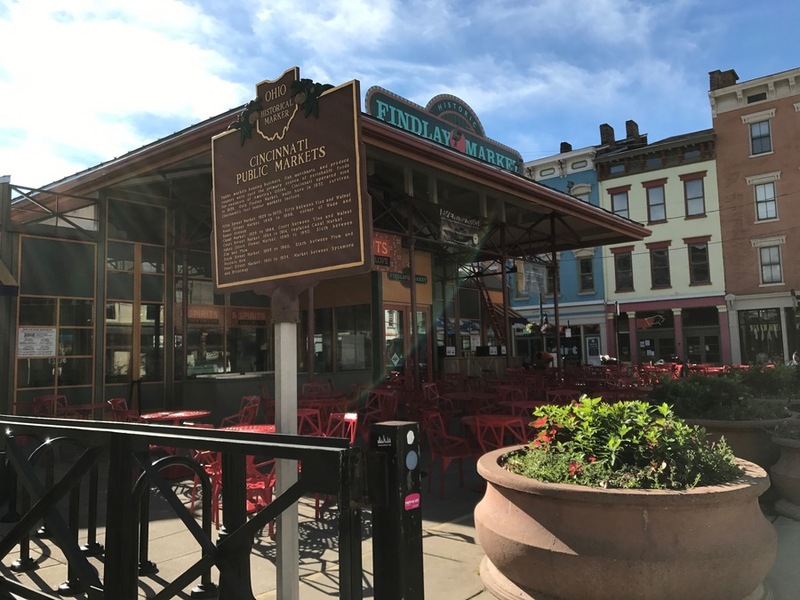 The old magic of Findlay Market and the Italiannate buildings that grace the neighborhood drew Brad and Karen Hughes to buy a home on Pleasant Street eight years ago. The addition of the streetcar line cinched the deal for them to want to open their own business. In 2015, they bought a vacant shell on Elm Street just north of the market house to create their Artichoke cookware store and upstairs apartments. They spent more than their $1.3 million budget to renovate the husk, but the risk paid off handsomely. Artichoke is meeting sales expectations, one apartment is being sold for $400,000, and the other is being rented for $2,000 a month. Some OTR advocates preach that old buildings need love. Wrong, Brad Hughes said. "These things take Benjamins. Lots and lots of Benjamins. Love comes later," he said. 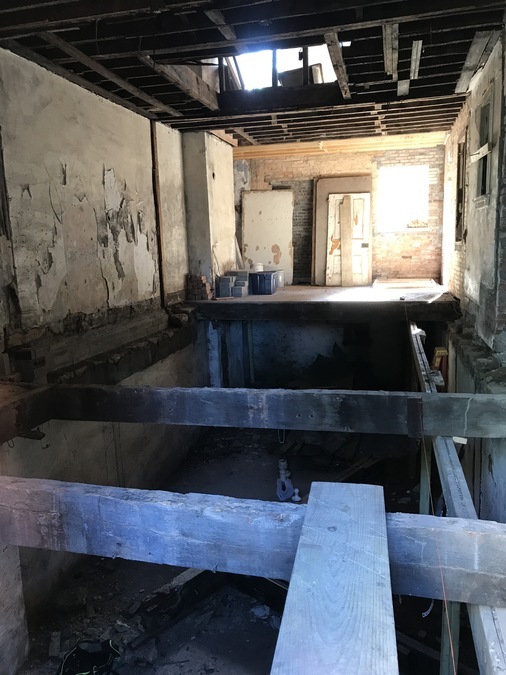 The couple are so taken with the area that they've purchased two more vacant buildings next door to Artichoke and are in the process of renovating them for their home, with new construction bridging the vacant lot that separates them. "We've definitely passed the critical mass. I think it's at a point where there's no turning back north of Liberty." The Hughes bristle at the notion that the neighborhood is anything but safe. Karen Hughes, who retired as an associate professor at University of Cincinnati's DAAP institute, said she doesn't walk alone at night but also used that same caution when she lived in Mariemont. They credit the streetcar as a big part of the resurgence, with a lot of customers saying they discovered the store when they ventured into town to check out the streetcar. Epicurean's Trombly echoed the sentiment, saying that the streetcar was a big factor in deciding to open on Race Street, right next to the tracks. Findlay Market itself has grown by leaps and bounds from drawing 250,000 customers annually 10 years ago to 1.2 million now. Saturdays draw between 10,000 and 13,000 customers alone. That's more people than the Cincinnati Bengals draw in a season. Only the Reds, Cincinnati Museum Center and Cincinnati Zoo have higher annual attendance among local attractions. Joe Hansbauer, president and CEO of Findlay Market Corp., said weekday traffic has grown, too, with 2,600 visitors on a given Tuesday. His goal over the next three years is to increase weekday foot traffic by 20 percent, which is attainable if residential and business development continues to grow around the market, he said. "A developed neighborhood is going to allow us to do that," Hansbauer said. But that success hasn't translated into full occupancy for the buildings surrounding the historic market house, a problem that illustrates the challenge of finishing redevelopment in the district. The strips of buildings facing the market house have nine vacant storefronts despite the boom around them. Hansbauer expressed confidence that five will be open or nearly open a year from now. The other four may not be for varied reasons. One storefront next to Market Wines is under a U.S. Housing and Urban Development Department foreclosure that makes it difficult to sell. A landlord of two more buildings has restricted approved uses for her properties and is asking for rents above what similar spaces charge, Hansbauer said. The last one is used as Luken's Poultry Fish & Seafood's warehouse for its distribution business. Hansbauer said vacant buildings that have been put up for sale have been purchased quickly and are in development for various uses. But buildings the city owns facing the market pose a special challenge for redevelopment. The city insists on maintaining ownership and control of the storefronts while encouraging people to buy upper floors for condominiums and apartments. That arrangement has made banks reticent to finance condominium development, Hansbauer said. Still, they all have potential suitors, and anyone with the cash to buy the floors outright can bypass the bank financing hurdle. Hansbauer is an enthusiastic supporter of extending the reach of Findlay onto surrounding blocks. He considers the Findlay Market district's borders to be Elm to the west, Findlay to the north, Vine to the east, and Liberty to the south. He said medallions are still mounted in the sidewalks on Elder Street near Vine to mark where vendors would set up shop when the market was bigger. Hansbauer wants the district to return to its earlier size but with a different mix of merchants than rows of green grocers, butchers and repairmen. Supported retail is the future, he said, including existing stores like Artichoke cookware and newcomers like Harvest Pizza, a new café being developed on Race by Model Group, restaurants and other niche businesses like furniture makers. "We don't want to replicate Vine Street," he said, referring to the booming restaurant and bar district on several blocks of Vine north of Central Parkway. "The population we're pulling has interest in food, kitchen ware, cooking at home, experimenting with new flavors," he said. Above street-level retail, Hansbauer said a mix of apartments, condominiums and offices is ideal because each draws different customers with different spending habits. Office workers will eat and shop more during the day than residents, and residents will be consumers in the evening. Roy Hackworth, interim division manager of Cincinnati's Housing and Community, said the renovation of Washington Park, construction of the School for Creative and Performing Arts on Central Parkway and other major developments are also driving demand for housing around Findlay. "It's creating a ripple effect. General Electric building downtown is going to attract people. They don't want to drive downtown. And if they can get to work via streetcar or Red Bike (rental bikes), they're going to do that," he said. Hackworth and his colleagues are focused on keeping the Findlay Market area accessible for low-income residents as well as those who can afford luxury. He said the area has 300 affordable housing units, and the city is trying to add another 50. "Get the critical mass of people there. If you have the people there, you can look at getting new commercial tenants in the storefronts and expand hours of existing ones," Hackworth said. Dent is bullish on the momentum continuing. "The nice thing about this area of OTR is that the structures are larger. Any of these buildings being redeveloped creates a major change. South of Liberty needed a lot of buildings rehabbed to create an impact," he said. "I'm real positive about what's going on."